At 6-foot-5 and 275 pounds, Demarcus Evans doesn't seem like he could very easily be overlooked. Yet it took until his fourth year as a pro for him to garner serious notice. After struggling with his command for three years, the 21-year-old Rangers right-hander led Minor League relievers with a strikeout rate of 16.6 per nine innings in 2018. Assigned to Class A Hickory for his first full season, he fanned 103 over 56 innings across 35 appearances while holding opponents to a .149 average. And despite his relative inexperience, Evans has more than held his own with the Surprise Saguaros in the prospect-laden Arizona Fall League, where he's struck out 12 over seven innings through Oct. 31. "When I first got here, I was kind of nervous," he admitted. "I didn't know if my stuff would play, but I found that it does play. Now it's about learning to command a second pitch." When he was dinged for two runs over a frame on Halloween, it was just the second time Evans had allowed more than one run in an outing this autumn, and he'd gone unscored upon and hadn't allowed a hit in three of his six appearances. The Mississippi native came into the 2018 season having issued 83 walks over 126 1/3 innings, mostly in a starting role. The Rangers moved him to the bullpen after Spring Training because they believed his fastball-curveball combination played up in shorter stints. The move allowed him to concentrate on two pitches -- he shelved his changeup -- and refine his mechanics. That resulted in a monster season in the South Atlantic League. "I was in my head a lot [before this year]," he said. "The Rangers coaches told me I've got the stuff to do it, told me to stop thinking so much and just throw it down the middle." Hickory pitching coach Jose Jaimes gets a lot of credit from Evans for helping the youngster to trust his stuff and for working him through a mechanical tweak that strengthened his follow-through and extension, allowing him to stay behind the ball more. Evans also began to derive power from his legs to create explosiveness, which made his fastball tick up from the low-90s to the mid-90s. But a lot of the big righty's struggles through his first three seasons had less to do with his body than his mind. "Everything was mental," he said. "I was trying to be too fine and pretty instead of going after them." At his size, it was surprising Evans didn't end up on a football field. But despite some offers, he made it clear baseball was his love. "I had [interest from] USM [Southern Mississippi], Tulane, Alabama State, some [junior colleges] ... San Jacinto," he said. "But when I was little, it was always baseball." 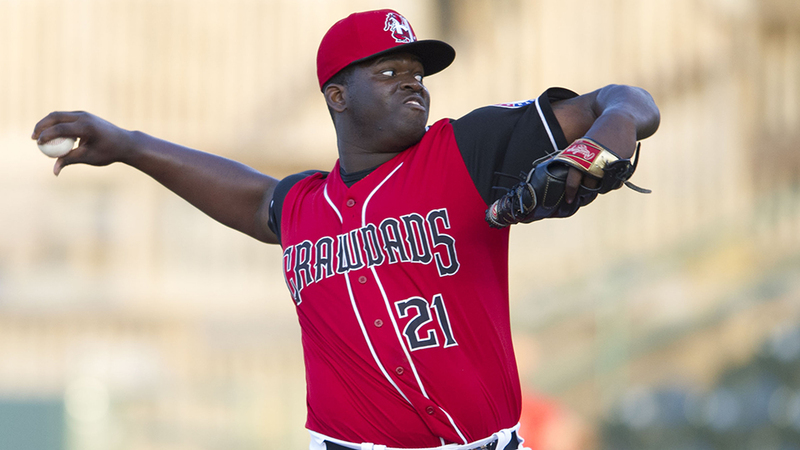 Evans got some buzz as a potential top-10-round pick out of Petal High School in 2015 but ended up falling to the Rangers in the 25th round. He thought about junior college and potentially entering the Draft again in 2016, but instead he took some sage advice from family. "I talked to my mom," he remembered, "and she said, 'If you want to start your [pro] career, now's the time.'" Three years later, that career has begun to take off. His second half of the 2018 season was especially impressive. Although he carried a 2.83 ERA -- dominant enough -- into July, he was pretty much unhittable following the SAL All-Star break. Over 20 second-half appearances, Evans struck out 66 in 33 innings and gave up 12 hits to hold opponents to a .110 batting average. After walking 21 in the first half, he gave out six free passes through all of the rest of the season. By year's end, he'd allowed one home run, posted a 1.77 ERA and recorded nine saves in nine opportunities. The performance earned him a nomination for the Top Reliever MiLBY Award. Most pitchers wouldn't be thrilled about transitioning from starting to working out of the bullpen, but Evans embraced the move. "I got into games more, and that's a way to build more confidence," he said. "As a starter, you get to pitch just once a week and it's kind of frustrating." The way Evans is dealing as a reliever, only the hitters are frustrated.